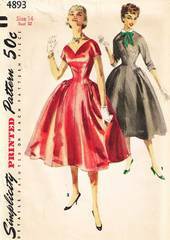 Lovely full skirted dress is similar in style to the "paper doll" silhouette dresses designed by Anne Fogarty in the 1950's. Sleeves are cut in one with center front and back panels. Side front and back bodice extends below waistline and joins full, gathered side panels of skirt. View 1, three quarter sleeved dress has high neckline detailed with a detachable collar and purchased bow. View 2, has a low V-neckline (front and back) and short sleeves. Uncut and complete. Envelope is age toned; tape mend/reinforcement to upper edge. Contents are in factory folds and in very good condition.